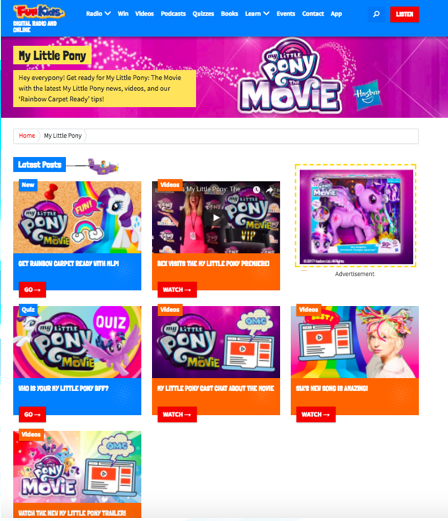 Our challenge was to create an unmissable campaign to promote My Little Pony:The Movie and the new Hasbro range of toys tying into the movie. To celebrate My Little Pony: The Movie and the new range of Hasbro products, Fun Kids created an immersive, multi-platform campaign to reach our audience no matter how they interact with us. The core focus was to engage the target audience of 4-11 year old girls and their parents, raising awareness of the My Little Pony brand, the movie release and most importantly – the Hasbro range. We kicked activity off on 1st October, ahead of the movie release, to build a buzz and create a real sense of excitement, which continued throughout October, with new content each week. 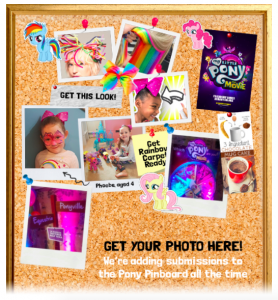 The campaign included sponsorship of The Club with Bex for one month, two competitions, spot adverts, a vlog, and a special weekend of activity making My Little Pony unmissable to our entire audience. This included a custom homepage takeover where we made the website black and white for the weekend, visitors could bring the colour back by waving the Rainbow Dash cursor over the screen. The campaign was a success with our audience who got involved with taking quizzes, entering competitions and sending in photos!